My little brother is getting married today and by 5:30pm I'll finally have the sister that I always wanted. When I was younger I always dreamed of having someone to share clothes with and whisper secrets to in the dark when I was supposed to be in bed. Unfortunately my sister-in-law and I are no where near the same size and a tad to old for sharing secrets, but even so, I'm glad to finally have a sister and she's marrying a wonderful man. Then again, I may be a little biased since this is my only brother, but let's just forget about that. I don't think I've mentioned this before, but I moved to Wisconsin the day after my own wedding. It was a hard adjustment to make because I missed my family, friends, and former colleagues, but I also missed the food. There are some things, like Provel cheese, St. Louis style pizza, and toasted ravioli that you can only find in St. Louis. While I still find myself frequently missing my friends and family, at least for this week I can enjoy the food. I've managed to hit all my old haunts while I've been in town, we certainly have some hidden gems spread around this city. Since I'm in St. Louis for the week celebrating such a momentous occasion in my brother's life I wanted to share a special recipe with you. It's one that never fails to remind me of home. 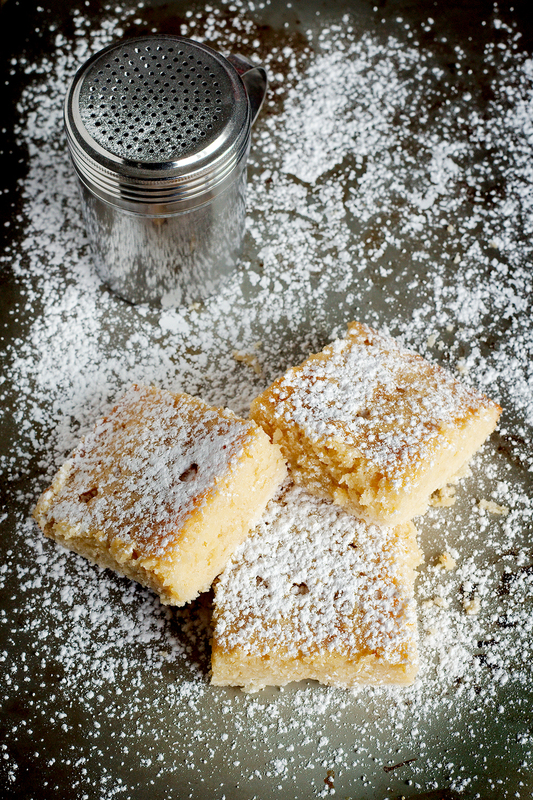 Gooey Butter Cake is one of the many culinary delights that St. Louis has to offer and it's a cake like no other you'll have tried before. Up until recently you'd only be able to find in the St. Louis area, although thanks to the New York Times food section it has gained quite a following across the country in the last few years. I was thoroughly impressed when they published a recipe for it back in 2009, even if was quite different than the recipe I grew up with. It's truly amazing that one of my favorite treats is slowly sweeping the nation. The great thing is that whether you're looking for something sinfully delicious for breakfast or something a little bit different to bring to a back yard barbecue this cake fits the bill. It always manages to be both a conversation starter and stopper. People often agree that it's just sinful enough to send you straight to hell, but it also manages to be a small slice of heaven in disguise. This cake manages to make quite an impression on everyone who tries it, so make sure you try it out so you can see what all the fuss is about. I promise you won't regret it. In a bowl combine four, sugar, and room temperature butter. Use a fork or pastry cutter to combine until fine crumbs form. Grease a 9x9 baking pan with butter, add the crust mixture, then pat firmly into the bottom of the pan. In a mixing bowl combine room temperature butter, sugar, and egg and stir until light and fluffy. Add one third of the flour, mix well, then add one third of the evaporated milk and mix again. Continue alternating between dry and wet ingredients until the full amounts have been added and all ingredients are well combined. Add light corn syrup and pure vanilla extract to the mixture, then stir until well incorporated. Slowly pour batter into baking pan, use a spatula to ensure the mixture is spread evenly on top of the crust. Bake in a pre-heated oven for 30 - 40 minutes. Allow cake to cool before cutting, top with powdered sugar and enjoy! If you want your butter cake a little more gooey pull the cake out after 30 minutes, if you prefer your cake a little more firm then bake it for the full 40 minutes. I normally opt for something in the middle and pull the cake once the center has firmed up. I do not recommend baking for longer than 40 minutes because the crust starts to darken which ruins the light flavor this cake is known for. St. Louis residents traditionally serve this cake for breakfast with a cup of coffee, but it makes a great snack or dessert too. Saint Louis Days Saint Louis Nights: A Culinary Tour of the Gateway City. St. Louis, MO: Junior League, 1994. p43. Print.